The discipline of Monotomic High Spin Metallurgy involves the transmutation of Noble metallic elements into single atomic super-conductive anti-gravitational states. The ingredients of all matter at & above the atomic level are made up of atoms with electrons that are in fact independent of one another. The total energy of the electron system is the sum of the energies of the individual electrons, or the charge. The term Monotomic Gold refers to elements that have been rearranged orbitally around their elongated nucleus causing the nucleons to stretch & spin. In Monotomic elements derived from the Gold Silver & Platinum Metals, by mutual attraction their electrons bond together, spinning at very high speeds with equal & opposite momentum. What Scientist have discovered through monotomic high spin metallurgy is that the Noble precious metals are composed of atoms that are not metals at all, & it is only the gluons, the bonds that hold the atoms in place that are metallic. 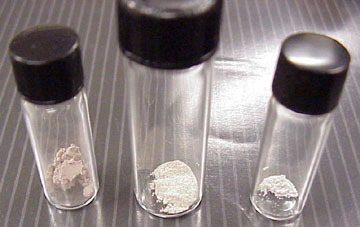 In the case of white powder gold & its ilk, upon completion of the transmutation process it becomes a unique form of silica. elements found in heavy metals are subjected to extreme heat they become a powder. They include White powder gold, Monotomic Rhodium & Iridium. David Hudson, who rediscovered the alchemical process & holds the patent for these elements, revealed that when these powders are placed on a scale, the scale actually weighs less than before the powders went in. This alluded to the fact that the elements have anti-gravitational properties that can be transmitted to their surroundings. These gravity resistant materials are now being applied to the aerospace industry. But it is not only the military who are interested in these asymmetrically distorted high spin group metals. Doctors have found when ingested these elements resonate with deformed body cells causing DNA to relax, unravel & correct itself. Consequently the medical fraternity is studying the properties of white powder gold in the application of cancer treatment. David Hudson theorized that the transformation from Gold with metal to metal bonds to Monotomic Gold was due to the electron spin clouds unpacking. As the Metal to Metal Bonds are broken through the various cycles of heating & cooling during the transmutation process, White Powder Gold, Platinum & the other transitional elements go through various changes, transmuting into liquid states before finally becoming a powder. It was called ‘an-na’ in ancient Mesopotamia, meaning ‘fire-stone’ and, ‘shem-an-na’ when made into conical cakes, or ‘high-ward fire-stone’. It was said to produce luminous light in a deadly nimbus of lethal rays, while at the same time being the active catalyst to physical longevity. This duality & paradox will come to define the properties of monotomic gold, as scientists discover that they are entering into a brave new world of Hyper-dimensional reality. Throughout its history white powder gold was recognized as having extraordinary powers of levitation, and teleportation. The attributes of these Monotomic Platinum Group Metals & their capacity as superconductors were also known to the Alexandrians, whom venerated the substance as coming from the heavens even if they did not understand its ability to trans-mutate & defy gravity. Desguised as an allegory of Alexander the Great’s journey to the kingdom of Ahura Mazda, we find a document called the Iter Alexandri Magni ad Paradisum. In this parable of the hero’s journey to meet the Persian god of light, the powder is described as the enchanted Paradise Stone, which had several supernatural properties and was said to outweigh its own quantity of gold even though when in powder form, a feather out-weighed it! In an antiquated world of levitation, divine intercession, communication with the gods, and priestly antecedence we find the attributes of monotomic elements described in the Biblical Ark of the Covenant, that according to sacred texts mimics the abilities of a modern day super conductor. But the earliest historical record belongs to the ancient Egyptians as it appears in Their Pyramid Texts & also amid the treasures of at least one of its pharaohs. The sacred writings which adorn the 5th-dynasty pyramid tomb of King Unas at Saqqara describe a district in which Pharaoh is said to live in perpetual Godhead. This Field of Mfkzt – an otherworldly locality associated with an extra-dimensional ‘Realm of the Blessed’ can only be accessed through initiation & ingestion of the substance called Mfkzt. Further references may be found reproduced in the bas-reliefs of the metals section, at the temple of Karnak of Pharaoh Tuthmosis III. There are various cone-shaped gold objects referred to as “white bread”. It was 1450 BC at Karnak where Tuthmosis III purportedly founded his metallurgical fraternity of Master Craftsmen known as the Great White Brotherhood. The name said to have alluded to their preoccupation with a mysterious white powder of projection. When Archaeologist Sir William Flinders Petrie discovered an unknown Egyptian temple at the summit of Mount Serâbît in 1904 while exploring the Sinai on behalf of the Egypt Exploration Fund, he found numerous inscriptions relating to ‘mfkzt’ amongst hieroglyphs associated with light. Mirroring the Karnak reliefs, along-side a depiction of Tuthmosis IV in the presence of the goddess Hathor were representations of conical bread-cakes. 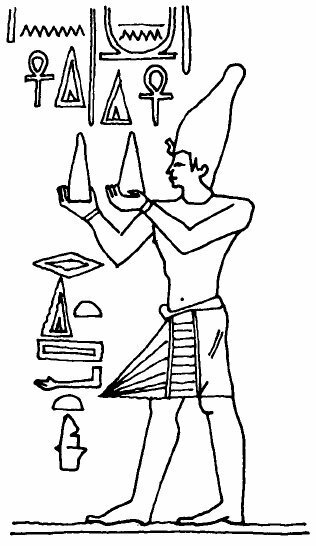 Before him were two offering stands crowned with lotus flowers and behind him a man bearing a conical object described as “white bread”. of the mystery schools (the Master Craftsmen) knew the riddle of its assembly. In the book of Job of the Old Testament, ‘mfkzt’ is ascribed to gold, bread and light, and classified as a ‘stone. It is also related to fire. 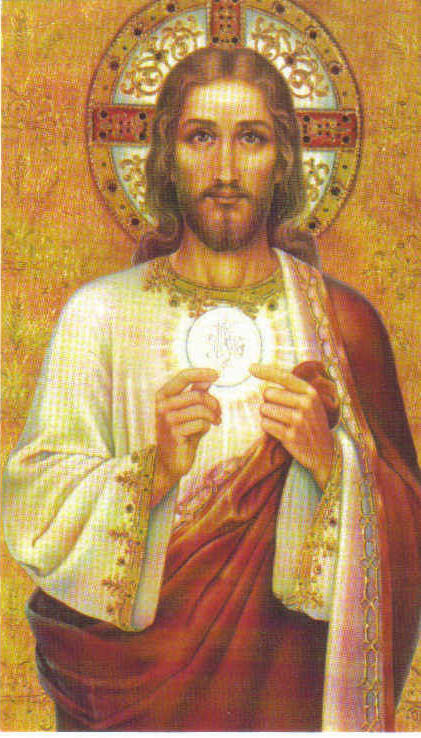 “As for the earth, out of it cometh bread;-“The text reads,”-and under it is turned up as it were fire. The stones of it are the place of sapphires, and it hath the dust of gold”. While in the book of Exodus, the high-ward firestone is described as a type of food. In the story of Moses and the Israelites at Mount Horeb in Sinai, Moses is enraged to find that his brother Aaron has collected gold from the Israelites and forged it into a golden calf. The ancient Biblical text goes on to say Moses took the golden calf, burned it with fire, transformed it into powder, mixed it with water, and fed it to the Israelites. The story goes on to explain that the fine powder could be wiped with frankincense and made into bread cakes, which according to the Septuagint Bible was the “bread of the presence”. The story also makes reference to a fire atop a mountain, tablets of instruction & the Ark of the Covenant, An especially designed casket that sent out lightning spearsfrom between the wings of the cherubim that adorned its lid. These bolts of Ark-light (‘electrikus’ to the Greeks) were referred to as “The Presence”, hence the term ‘bread of the presence’. Paradoxically, although made from noble metals, the monatomic ‘powder of projection’ as referred to by the ancients is classified as a ‘stone’. Nicolas Flamel the 15th-Century medieval chemist of renown also pursued the manufacture of monotomic metals in the guise of the Philosopher’s Stone. Simplified, this was a process that could turn base metals into Gold. Flamel writing his last testament, dated 22nd November 1416, wrote that when the noble metal was perfectly dried and digested, it made a fine “powder of gold”, & thus was born the modern legend of the Philosophers’ Stone. Taking into account the writings of the 17th-century Alchemist , Eirenaeus Philalethes, in his 1667 treatise entitled Secrets Revealed, He refers to the constitution of the Philosopher’s Stone thus- “Our Stone is nothing but gold digested to the highest degree of purity and subtle fixation … Our gold, no longer vulgar, is the ultimate goal of Nature”. -Meaning that the Stone was itself made of gold, and that the philosophers’ art was in perfecting this process. In another treatise he concluded “It is called a Stone by virtue of its fixed nature; it resists the action of fire as successfully as any stone. In species it is gold, purer than the purest; it is fixed and incombustible like a stone, but its appearance is that of a very fine powder”. 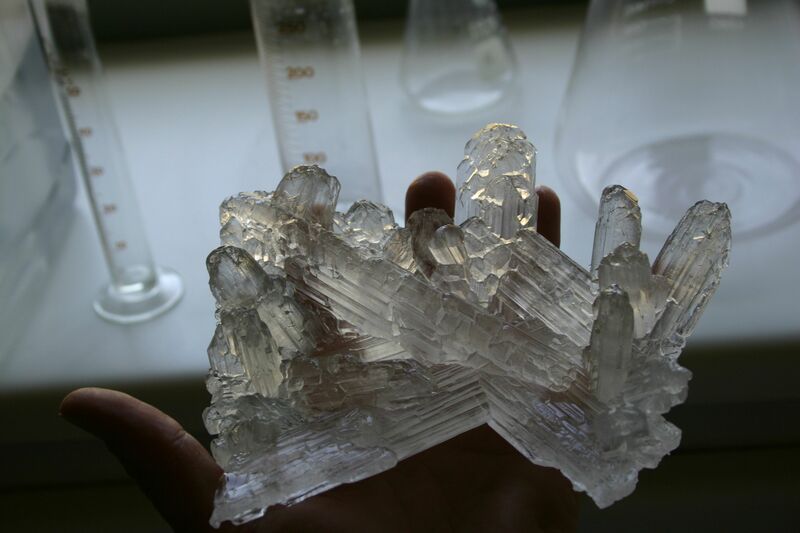 Monatomic elements are most certainly in high proportion in volcanic ash, but the easiest method to obtain pure monatomic elements is to isolate them from sea salts using lye- sodium hydroxide. This is the same method the essenes used when obtaining MANNA which is monatomic elements. It is best to use a mix of different sea salts due to the fact that each salt is high in different monatomic elements. Dead sea salts are high in monatomic gold and platinum group elements. If anyone is truly interested in learning the great art in its entirety, feel free to contact me at boulton.brandon82@gmail.com . The 5th element is the birthright of every person and to those who want to truly learn and evolve I am willing to help. Outstanding information. This is the kind of information that every child on this planet should be able to master before they leave elementary school. Oh, how the cabal conspires to keep highly significant information like this obscured from Humanity while they enjoy all the benefits selfishly.